The Rebel Sweetheart. : Spotlight | Yummi Pouch. In lieu of Makeup Monday, I'm posting this long overdue review of the Yummi Pouch, which came in the mail a few weeks ago. I had issues claiming it at the post office because of the Registry Notice (the card which you present upon claiming your mail) that somehow never made it to my address. Anyhow, with that over and done with, and the parcel finally in my hands, let's now move forward to review. Yummi Pouches in the classic 6 oz size. The Yummi Pouch is the brainchild of Andy and Katie, a married couple based in Issaquah, Washington. Inspired by their daughter, they designed Yummi Pouches to help parents meet their children's fundamental need of good nutrition while making the feeding process simple, eco-friendly, and cost-effective. Their vision is to provide moms and dads with a simple container to fill with delicious homemade blended snacks. There are four key features to these reusable pouches. 2) Dishwasher-friendly, and very easy to clean, too. 3) Child-friendly, as they're BPA-free and phthalate-free. 4) Made with high-quality, recyclable materials that allow you to use the products over and over again. you can write down the contents and the date of storage at the back of the pouch. Yummi Pouches are easy to use. Simply open the zipper seal found at the top, fill it in, reseal. That's it. If you're storing smoothies, you can pour the contents directly from the blender. For pureed food, you can easily spoon the contents into the pouch. The bottom gusset expands, allowing you to store 6 ounces of food or drinks. Bottom gusset. Pouch stands upright when filled. Contents (e.g. liquids, purees) are dispensed through the spout on the side. The caps have locking tabs which lock them in place. Young ones can be fed directly from the Yummi Pouch, as seen below. Moms with toddlers, you gotta love this! As for me, I use the Yummi Pouch for my son's snacks (cookies, bread sticks, pretzels and the like), which he brings to school. The Yummi Pouch comes in different sizes (mine is the Classic 6 oz), and they have different designs, too. One thing, though. They're not available in the Philippines and I reckon they're not available at major supermarkets in the US. You can, however, purchase them online via the Yummi Pouch store or through their registered resellers. They offer free shipping within the US for orders over $30, and yes, they have international shipping, too. Overall, I find the Yummi Pouch a very useful product. 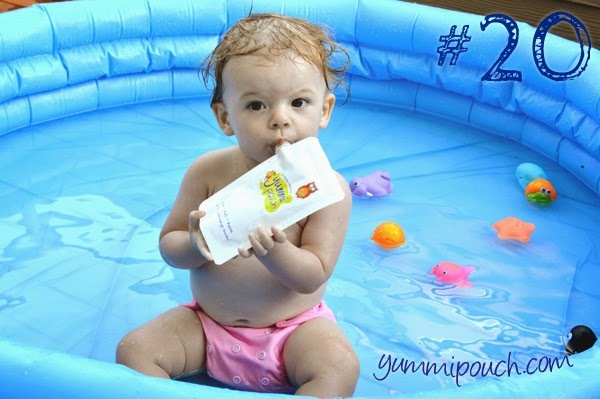 It's safe for kids, it's handy and convenient, and can be used for storing so many things aside from baby food. They're reusable and chemical-free, so even if you're paying $14.99 (around Php 680) for a set of 6, I do believe you are getting your money's worth. Purchasing your own Yummi Pouch? Use the promo code PARTY4YP to get 10% off your purchase at the Yummi Pouch Store! An OC mom like me needs these pouches! I'm a big fan of zip locks and this one is I think the more fun way of using zip locks. Thanks for sharing! I love that it is reusable. Then I can fill with stuff I buy and save money. These are handy for the kiddos. Those are really cute. I love that you can reuse them. Buying this is very practical than using using disposable plastic bags to pack lunch, very good for kids and also for adult who still enjoy BAONs. Oh I have some of these in a different brand and was looking for more... I'll check these out. Thanks! eeeee.. ang cute ng son mo! : anyway, it's like a blood bag haha! But yeah, this is so handy and can be used for liquids or solids. Oh this is a nice alternative to plastic disposable sandwich bags!